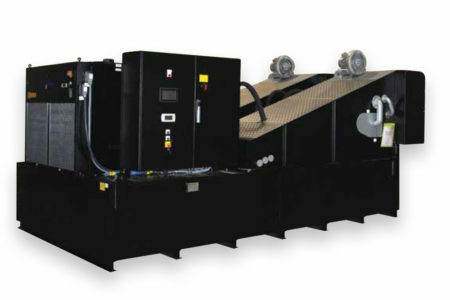 The Centrifuge Coolant System offers a different approach to cleaning cutting fluids and separation. With an integrated sump, the dirty cutting fluid is sent to the spinning centrifuge bowl where the solid material is thrown to the side of the bowl at forces exceeding 1000 G’s. 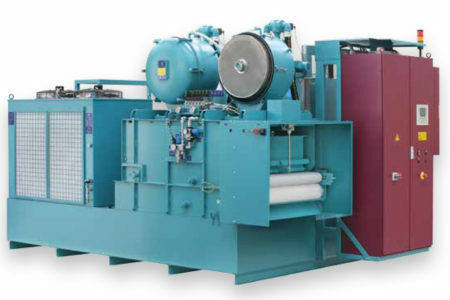 Unlike traditional filter systems, the centrifuge coolant system does not use disposable media, making it one of our most environmentally friendly filters. Instead, the system is designed to allow the user to reclaim the separated product. This is especially useful with carbide, steel, glass, ceramics, and any other application that uses materials with a higher reclaim value. 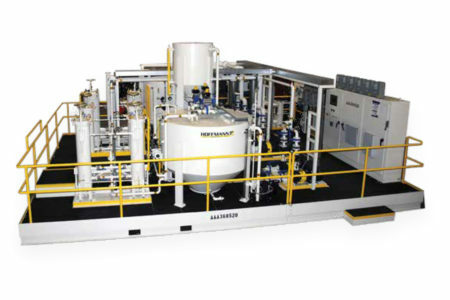 Hoffmann Filter offers two types of manual centrifuge systems and an automatic centrifuge system. 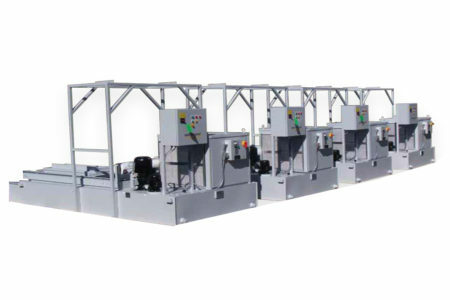 The automatic system sends the centrifuge into a cleaning cycle, and the solid material is dropped into a container where it can be disposed or reclaimed. Tanks for the centrifuge system are custom made to suit your needs exactly. 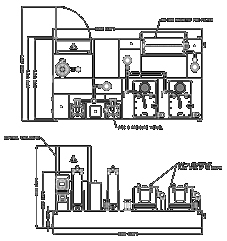 Optional equipment for the centrifuge systems includes fine filtration bag systems, magnetic separators, and chillers. UBF // The Indestructible One – Suction Band Filter system for applications with a high stock removal rate, and where fine filtration is required, nothing is more efficient. The Deep Bed Band Filter System takes the traditional band filter concept to the next level. Superior filtration and no messy overflows. 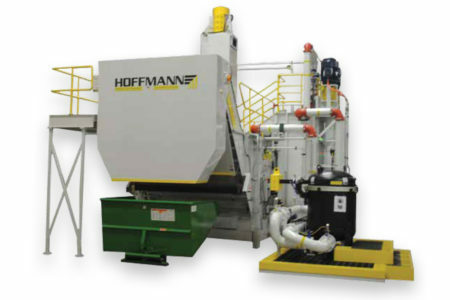 The Original – the Hoffmann HSF Suction Belt Filtration System has become a global market leader for gear grinding applications. 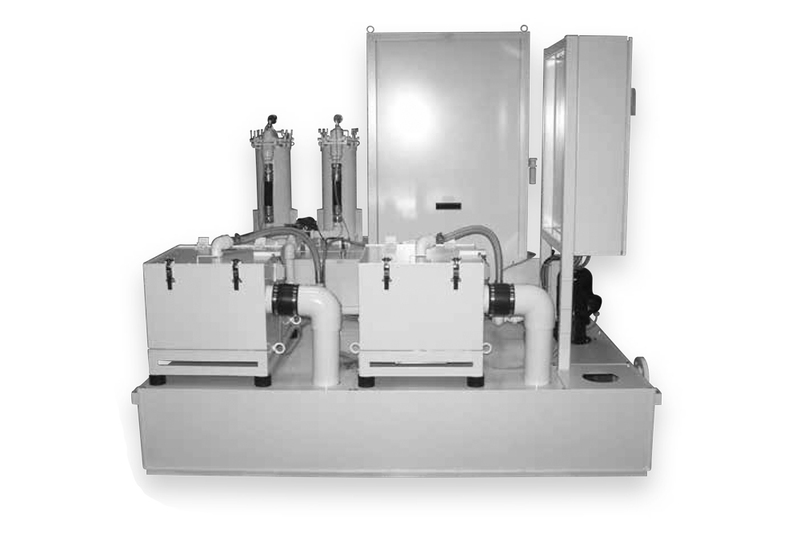 Ideal for water-based applications, the Flat Bed Band Filter Systems are fully automated yet economical systems. 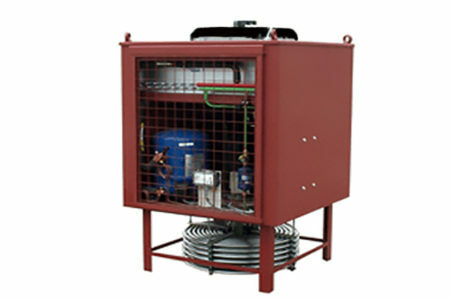 Hoffmann Filter Corporation offers a complete line of accessories to compliment our base filter systems. 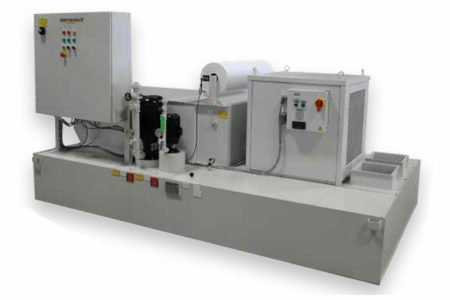 The Centrifuge Coolant System – A different approach to cleaning cutting fluids and separation employing forces that exceed 1000 G’s. The Clear One – For extremely fine filtration and great success on applications that require an extremely high surface finish. At Hoffmann Filter Corporation, we have the ability to use several different models of our filters to run as centralized systems. Hoffmann Filter Corporation has been in business for over 30 years, and we have made a name for ourselves with our product excellence and superior customer service. We believe our customers deserve the best service we can offer, both while we’re designing your product, and long after it’s running on your floor. At Hoffmann Filter Corporation, we pride ourselves on providing solutions tailored to a wide variety of industries. We serve the aerospace, automotive, medical, tool, and wind industries, along with many others. With the widest line of products available in our industry, and a full variety of accessories to compliment our base models, Hoffmann prides itself on being able to meet the diverse needs of all our customers.